"First of all, let me say that the photo I took doesn't quite reproduce the beauty of this plate. The colors on this plate are just gorgeous! The background is a pretty bright blue and the main image is a red and white Christmas ornament. 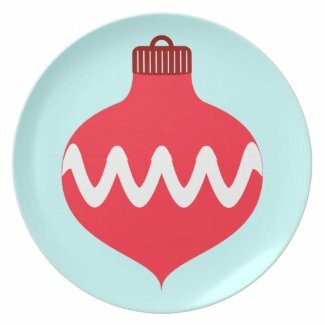 I bought this plate for serving on Christmas. I haven't decided if it will serve cheese and crackers, veggies, or Christmas cookies yet, but it is a perfect little plate for any of those!" -Jasmine W.
Hello! I saw your post on Zazzle. I would love to do some reviews. I could do a really good custom card review. I've tried cards through Winkflash, Zazzle, CafePress (only postcards), ArtsNow, and Shutterfly.